A new, $17.8 million grant will ensure USC remains at the forefront of research to protect people from tobacco-related health risks. The money will be used to promote biomedical and behavioral research to build the scientific underpinning for regulation of tobacco products. USC is part of a national, federally funded program to assess and prevent harm from tobacco products. The grant comes at a time of change across an older generation that grew up when cigarettes dominated the tobacco market and a new generation is exposed to various forms of tobacco. Change is driven by new technologies such as vaping devices, flavored products and social media marketing. USC will use the funds to pay for research for the next five years at the USC Tobacco Center of Regulatory Science (TCORS). It is one of nine such federally funded research centers nationwide. In particular, the USC center studies use and health effects of electronic cigarette products. Youth-oriented social media marketing and conversation about tobacco products. Effects of e-cigarette product marketing at vape shops on customers. A survey of vaping and smoking in 6,400 Southern California teens and young adults from age 14 to 24. Laboratory studies of which types of e-cigarettes are appealing and addictive to young people and desirable for adults interested in quitting smoking. Funding comes from the U.S. Food and Drug Administration’s Center for Tobacco Products and is administered by the National Cancer Institute, which is part of the National Institutes of Health. The program is authorized by the FDA’s Family Smoking Prevention and Tobacco Control Act of 2009, which Congress passed to protect youths from tobacco products. Today, tobacco products are diverse as cigarettes comprise a diminishing market share while e-cigarettes gain in popularity. E-cigarettes are non-combustible products that simulate a smoking experience. Some longtime smokers might use the devices to kick the habit, yet the devices pose new risks of early introduction to nicotine and potential addiction for children who vape. 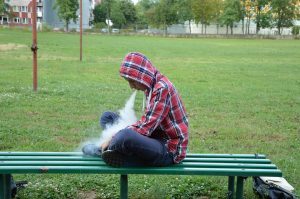 Earlier this month, FDA Commissioner Scott Gottlieb declared youth vaping an “epidemic” and threatened to halt sales of flavored e-cigarettes unless manufacturers show they are trying to prevent their use among children and teens. Against that backdrop, the USC program theme is “Products With Populations.” It will focus on characteristics of e-cigarettes that attract youth but are not appealing to adult smokers interested in switching to e-cigarettes. The goal is to inform regulations that may protect youth without discouraging smokers from switching to a less harmful product in e-cigarettes. Among the research concentrations are youth-oriented e-cigarette flavors and cartoon labels. Researchers will also study social media. The goal is to better understand the interplay between human behavior, modern communication and health risks. Study participants will be residents of Los Angeles and surrounding communities and represent various races and socioeconomic backgrounds affected by tobacco. The findings will inform socially-conscious policies that help to correct disparities in tobacco-related illness. In the end, the goal of the program is to provide the FDA with evidence to address what is arguably the greatest current dilemma in tobacco policy in how to regulate e-cigarettes. The USC TCORS will inform regulatory policy that benefits the entire population, regardless of age, smoking history or sociodemographic background. The USC center also educates and trains the next generation of tobacco regulatory scientists. For more information, visit the USC TCORS website. Caption: USC researchers focus on protecting teens who vape from nicotine and tobacco addition.